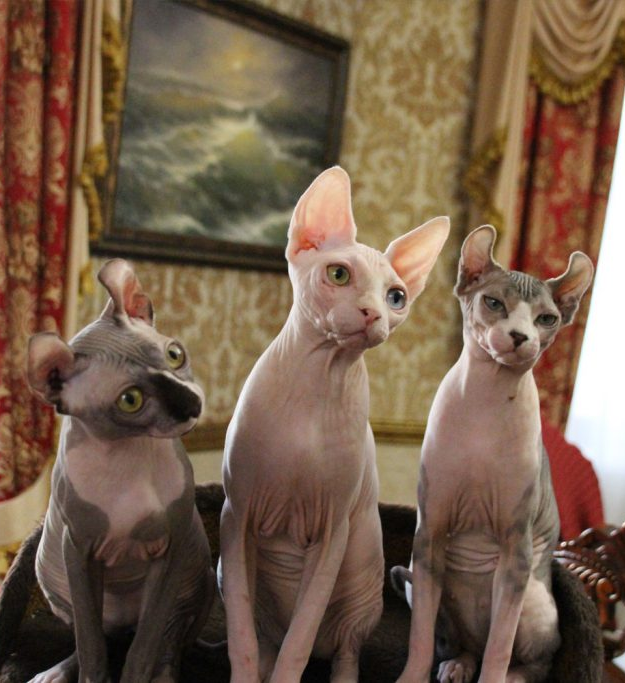 You can find a variety of information about the hairless cats breed on our site: Sphynx, Bambino, Elves; photos of kittens, origin story, articles, and content. Also you can find information about how to take care of bare kittens, pregnancy, parturition and physiology and stay tuned about “Magnificent” cattery news. We are glad to offer you our beautiful kittens. Our cattery is situated in Sochi, Russia, and all of cats are our family members. We take care of each pet, they get balanced diet and regular veterinary care. Our kittens are born only from the planned matings, as a result of careful selection of pairs of producers (only with excellent health and the best breed data). Our kittens grow in love and care, and leave for a new house at the age not earlier than 3 months. Our kittens move to their new owners fully accustomed to the tray, to the nail and to independent food. They are amazing, warm and loyal creatures. Their love is sincere and selfless. They are sociable, sweet and trusting. When they communicate with you – they are like children. When they play – they are like monkeys. You can find a bit from a dog and a bit from a parrot in them. But be sure that you definitely will find a wonderful friend! MAGNIFICENT is a cattery of Elves, Bambinos and Canadian Sphynxes.